Review of the CSB Study Bible for Women – create trust daily. I am so thankful to get to review this gorgeous Bible for women! I have been itching to do a study of the women in the Bible for a while now, so this Bible was even more fun to go through since it highlights the women in the Bible. I will be honest and say I did not keep this Bible (sad face), I actually gave it to my mom for Mother’s Day (yay!) She loved it, and she even got a Bible cover and some gel highlighters in addition to the Bible – so she got hooked up! So real quick on the size: I love this size (even though it is not as portable as my ESV Journaling Bible), it is basically the size of the CSB Spurgeon Study Bible I reviewed recently. Because of the size of the Bible itself, the font is also a good size for easy reading! I really wanted to show you all the fun sections of this Bible so I took a few photos to share them. Like I mentioned previously, the CSB Study Bible for Women does a great job of highlighting women throughout scripture. It features sections like “Biblical Womanhood” which shares ways to apply the Word to your daily life, and then my FAVORITE section are the “Character Profiles.” I love that each woman’s Character Profile is right there in the book or section that she is found in. Like many study Bibles, the beginning of each book has some fun facts and history for you to read through. The CSB Study Bible for Women makes this section so pretty and colorful! And last, but never least – look at these fun timeliness along the bottom of the Bible! SO colorful and helpful for keeping track of where that particular book of the Bible takes place in history. So honestly, if I didn’t have the Spurgeon Study Bible already, I would get a copy of this Bible for myself! It is is colorful, it is fun, and more importantly it is packed with such interesting and helpful text to help you study God’s Word! 2. The Gel Highlighters in these photographs for this post are from The Daily Grace Co. – I use them daily and highly recommend them! 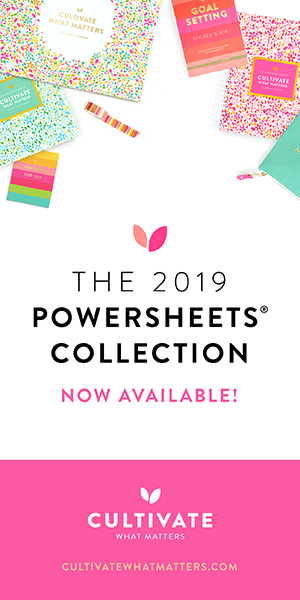 Cultivate What Matters – Powersheets and What You Need To Know About Them!